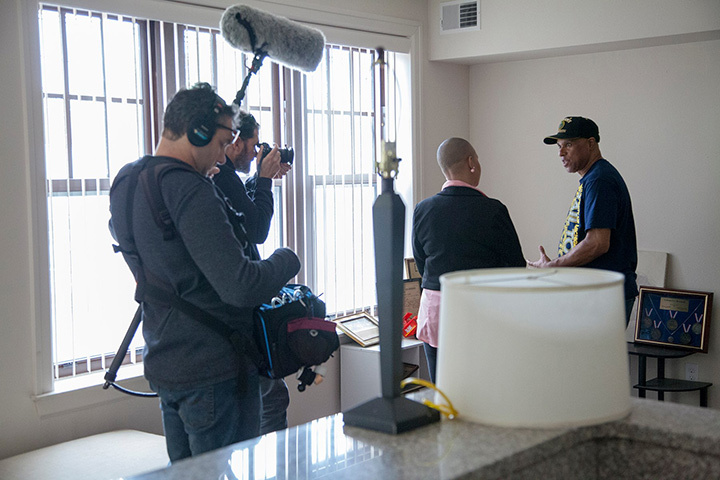 Formerly homeless veteran Lawrence Rucker is filmed in his apartment speaking to our SSVF caseworker Alexis McFadden. A documentary crew is filming with Southwest Solutions for a special national initiative to address homelessness, particularly veteran homelessness, that will be announced on June 26. The crew accompanied our PATH homeless outreach team and then went to the apartment of a veteran, Lawrence Rucker, who had been homeless until our Supportive Services for Veteran Families (SSVF) team assisted him. Lawrence moved into his apartment last week, and the SSVF team arranged to have furniture delivered to his place today. The film crew is also featuring our Piquette Square for Veterans. See more photos in the Facebook story.